Four years, 1.2 million Instagram followers, one fierce, feminist beauty icon: Jamie Genevieve is a girl of our times. 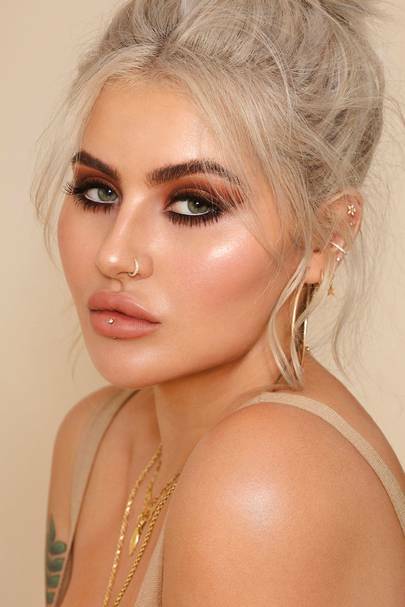 While the Scottish-born makeup artist and global social media sensation has long been inspiring us with her glam makeup tutorials, which regularly pull in millions of views, it's her down-to-earth attitude, authentic chat and self-acceptance mantras that really make her role model material. With the release of a new , #Unfiltered, lifting the lid on what the life of a social media influencer is really like, as well as the magic ingredients required to cut it at the top of the online beauty trade, we sat down with Jamie to talk fame, fans, and finding your niche. What's your secret to growing such an epic online following? I wish I could tell you! When I sit and really think about how many people follow and support me it is so overwhelming. I think the weekly vlogs that we create (me, my fiancé Jack and Drogba the German Shepherd) give people an insight into our real lives. We do have such a great time but we’re also very normal which I think people appreciate. No candy coating here! What 3 tips would you give someone starting out now on Insta? Find a niche - Find something about yourself that is unique and you want to teach and share with people. There is no one else out there that is the same as you. Be consistent - Posting at least once a day is a great start. Don’t be scared to show your personality on stories too! It’s amazing how much we all have in common and sharing the true you can really strengthen the relationship you have with your audience. Do it for the passion, not the followers - People can tell when you truly love what you are creating. When I started posting my makeup pictures and reviewing products it was all a hobby to me. For it to be my career makes me feel so lucky, I just love it. What's been your best experience since finding fame? Fame is never a word I’ll get used to! I love that I have been able to travel with my work, I’ve been able to visit so many of my bucket-list destinations. Sometimes I watch old vlogs just to look back and see some of the places we’ve travelled and amazing things we’ve been able to experience. Who is your fav celeb you've met? Have any of them given you great advice? Drew Barrymore is such an amazing person. I’ve been a fan for a long time and when I met her she was just as you’d imagine. Fun, warm, caring and so lovely. I had the pleasure of filming with Drew for her brand Flower Beauty and it was definitely a huge moment for me. Why do you hate the word 'influencer'? I think the word influencer can feel quite cold. I want to show my followers what products I’m loving and how to use them, not just ‘influence’ them to buy things. I definitely don’t hate it, I understand why the term is used to explain this job but I feel beauty blogger/guru suits too. What was it like working on your own documentary? It was definitely up there with one of the hardest things we’ve done. My fiancé Jack and I are so used to being in control of what we create so it took a while to get used to someone else having that control and trust them. We’re so thrilled with the end result and have been blown away by the positive feedback from everybody. What are the 5 makeup products you can't live without? Any quirky beauty hacks you swear by? I absolutely love to drench my freshly done makeup in setting spray then fan my face dry with my little Spanish fan. That face of makeup won’t be going anywhere! Any new makeup application tips we haven't heard of? One thing I’ve been loving lately is a winged liner but starting in the centre of the eye. By leaving the inner half of the lash line free of product I think it makes the eye look a lot more fresh and open. Perfect for a day glam! I’ve also been using a lot of liquid products (bronzer, blush, highlight) pounced into the skin with a damp beauty blender then only powder the centre of the face. It makes the skin look so fresh and radiant! What is the one budget product you can't live without?